Kingdom Hearts: Union X is an action role-playing mobile game from Square Enix. 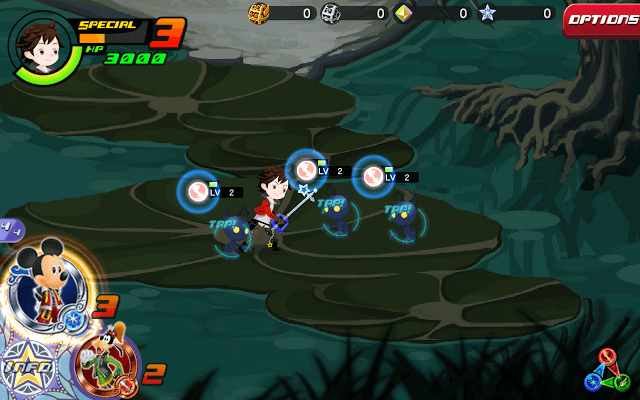 The game has a unique battle system that lets players use medals to attack enemies. Gamers will also enjoy taking advantage of special gesture-based controls to fight baddies. The events in this game take place before the ancient Keyblade war. Using your unique weapon you will have to overcome darkness and the only way to do this is to defeat heartless and other enemies. You will also come across several huge bosses from time to time and will get an opportunity to rescue characters from the Disney universe. You will come across various enemies, but you don’t have to fight each one of them, especially if the enemy is stronger than your character. You won’t engage an enemy unless you tap it. You can easily avoid by not tapping him and taking a different route. In one level I could easily go past a few “heartless” by moving my character around them. I did not tap on them I just tapped the empty area where I wanted my character to move to. If there’s space around enemies, then try tapping those areas or just tap and hold empty areas to keep moving your character past enemies. However, in several occasions, there won’t be any space around enemies and you will have to fight them. Beware of enemy ambushes. Usually a treasure chest will be guarded by a heartless or some other enemy and you may try to avoid it by moving around an enemy and then opening the chest, but in some occasions enemies will appear from nowhere and will have a first attack advantage. You won’t have any option but to fight them. Keep following the “Target” mark and try to move in empty areas to avoid confronting enemies. However, you may choose to fight every enemy you see if you are in desperate need of “Attack prizes”, which is used to fill the special attack gauge or Lux, which is used to level up. Most enemies you defeat drop these two key objects. While avoiding stronger enemies is the best way to preserve your HP, battling weaker enemies is a sure-shot way to get extra Lux and attack prizes. And you should do this if the enemy’s attribute is weaker than yours. There are three main types of attributes – Magic (Blue), Power (Red) and Speed (Green). Magic is stronger than Power. Power is stronger than Speed and Speed is stronger than Magic. Each enemy has an attribute icon shown above him. Look for enemies with glowing icons. Such enemies usually have weaker attributes than your hero and can be easily defeated in battle. Defeat weaker enemies before their turn to get extra attack prizes and Lux. You will need certain materials to level up your Keyblade – your weapon. Strengthening your Keyblade provides a stats boost to your medal slots. Go to menu > equipment and press the “Keyblade LV Up” button. A tiny screen will pop up showing materials required in order to upgrade your weapon. The “Strengthen” button will gray out if you are short of “Needed” materials. To get materials, look for sparkling pixie dusts scattered all over a level map. Move your character close to them to acquire them. Pixie dusts hide random materials, so keep unlocking them whenever you spot them. Enemies may guard pixie dust, but you can still get them without fighting heartless. 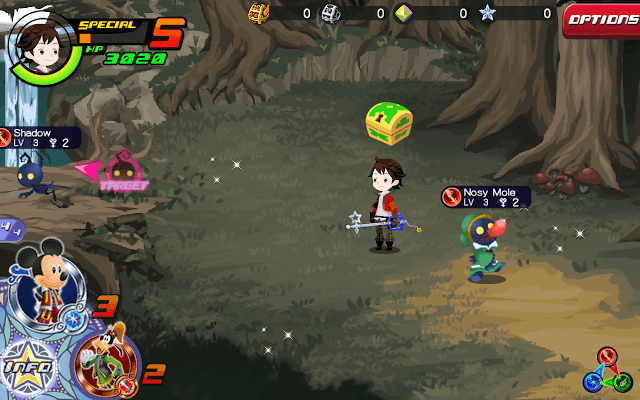 Do read Tip No.1 on how to bypass enemies in Kingdom Hearts: Union X. Upgrading medals will boost key attributes like STR and DEF. Every time a medal gets upgraded, its STR, DEF and cost increases. 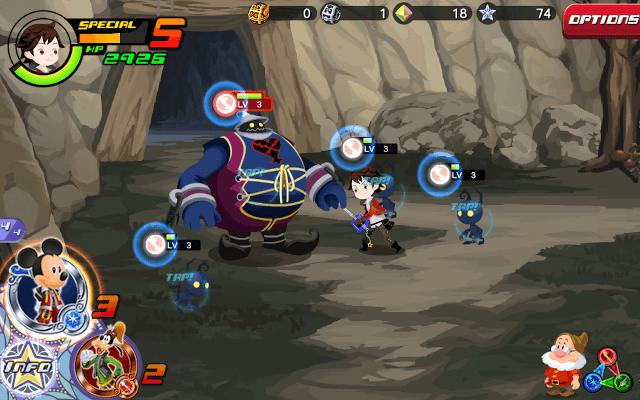 A leveled-up medal can deal more damage to enemies, especially mini bosses at the end of a level. Try to level up an equipped medal using a spare medal that belongs to the same attribute to get an XP boost. For example: If your medal has the magic attribute, then try to add medals with the magic attribute to empty slots. Don’t use medals that have STR DEF attributes. Use common medals that don’t have these stats get an XP boost. The Dewey medal is an example of a medal. You can get such medals in most levels. Special attacks deal more damage to enemies than normal attacks. Each medal has its own unique special attack. Go to “Equipment” and tap a medal to see what unique attack it deals to enemies and how many gauges are required to activate it. A medal’s special attack is activated when its required special attack gauges are met. The Special attack gauge or meter can be seen at the top-left corner of the screen. The meter fills when your character collects Attack prizes from each slain enemy. While playing, just keep an eye on the number beside the special attack gauge. Before that, memorize or keep a note of number of required gauges of each medal. When the number beside the gauge meets the required gauge number of a medal, drag and drop the glowing medal on to your enemy. 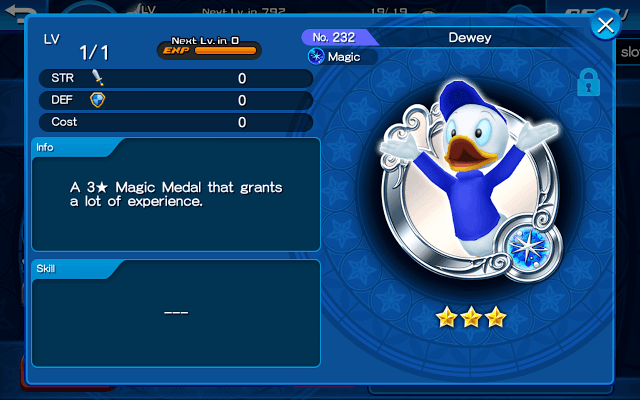 For example, one of your medals is KH II King Mickey and its required special attack gauges is 3. When the number beside the special attack meter at the top-left corner of the screen hits 3, its special attack gets activated. The medal will glow. You just have to drag the medal and drop it to your enemies to unleash special attack. Don’t use special attacks on common enemies. Use it against hard-to-beat baddies and mini-bosses. Let the gauge fill up completely. When you approach your Target, try to use up all special attacks so that the mini boss is defeated before his turn arrives. This way you might complete one of your objectives, which grants rewards for beating target enemy within 1 turn. Don’t forget to upgrade your medals and put them on slots that give attribute boosts to strengthen their special attacks. You can earn avatar coins (AC) by completing story level and special level objectives. Three goals will be listed under “Objectives”. Of these three, at least one of two objectives will award Avatar coins upon completion. Complete objectives such as defeating target enemy within a turn, using special attacks, defeating a certain number of enemies etc to get them. ACs can then be used to unlock avatar board nodes. Tap Menu > Avatar Board and tap a board to view its nodes. Don’t tap those that require jewels. Next, tap a node and then tap “Unlock”. Make sure you have the required Avatar coins to unlock it. Don’t waste your precious avatar coins in unlocking accessories. Usually, accessories nodes can be found at the end of the board. Use ACs to unlock nodes that increases the AP cap (AP is like “energy”. 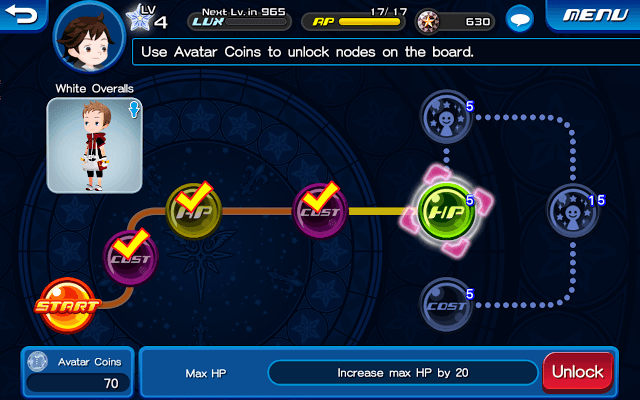 You will need to spend some AP to start playing a level), Keyblade cost capacity, and max HP. You can use any unlocked Avatar board to start unlocking nodes. Just because your avatar is male does not mean you cannot view and unlock a female avatar board’s nodes.